Drug Discovery researchers working in academic institutions and biotech/pharmaceutical companies (and often the collaborations between them). CDD Vault Reviews Recently Reviewed! Pros: In our drug discovery organization, CDD is a central feature for biological data storage, analysis, and reporting. Its intuitive interface requires a minimal learning curve to register compounds, generate assay curve fittings, and produce useful data reports. Numerous built-in options allow additional customization to your projects or your organization. Sharing specific data with collaborators is very easy through the use of readily available links, user-defined collections, and saved searches. We use separate virtual vaults to record, communicate, and assess new design ideas, thanks to a growing list of "calculated chemical properties" offered within CDD Vault. The support team at CDD is exceptionally responsive and helpful, allowing all our requests to be promptly and effectively answered. Cons: The CDD team is eager to keep improving their product via customer feedback, and thus most of the CONS eventually get resolved over time. One function that we would really benefit from is a temporary "working space", where data could be reviewed and analyzed by the uploading scientist prior to publishing to the main vault for all collaborators to see and use. Pros: Each feature is well thought out, tested (yes tested!) and documented. The interface is clean and does not overwhelm the end user or admin with unlimited configuration. I have helped deploy this software at over a dozen biotechs and most are up and running in a week. Compare that with a an expensive slow deployment of most other drug discovery platforms. Loading data into the system is quite easy and reliable with "error" and "warning" messages which are descriptive. Searching for and viewing data also gets high marks. From an admin perspective I find the system to have very low overhead. Cons: There is not a lot I dislike about CDD, most items are addressed by the development team via a request. If I had to pick something it would probably be updating DRC data (specifically DRC) which has already been processed by end users. Ultimately this can be a bit cumbersome as you can either update in the CDD interface which is not quite perfect for editing this data OR you can reload the data. Reloading the data is less than desirable so it would be great if the interface undergoes some renovations. Excellent software and even better customer service. Pros: We use CDD to store, manage and analyze large amounts of drug discovery data generated from high-throughput screens and dose-response assays. To automate data analysis, we make extensive use of curve-fitting software (which works!). We've found numerous benefits of using the CDD software for drug discovery. For example, one can quickly find all data associated with a given compound ' and within that data, track down data associated with individual batches of the compound. We also use CDD to share data with our collaborators using a feature of saving searches, which entails the collaborator simply clicking a button to visualize data in a format that we set up. The best feature, of course, is that CDD's staff is fantastic and incredibly helpful. Unlike other companies, they quickly get back to us to address our questions ' often by phone ' and have made every effort to facilitate our work so we can focus on drug discovery and not spend our time worrying about database management. As a bioinformatician scientist, I find this tool very useful. Pros: As a bioinformatician scientist I find this tool very useful. It serves both our biologists and medicinal chemists scientists. The fact that it includes additional outsource valuable resource of information e.g. PDB, Chemogenomics databases assists sometimes in first-step hits characterization. The Support team should get 13 out of 10 STARS, one of the best support that I got. Cons: The QC process currently only provide several reports, but I think that professional tools that enables to search the database directly could be better. Pros: We are running HTS and hit to lead using a semi-virtual model: all bicohemical and cellular testing is done in house; med chem, chemistry, ADME/PK and XTAL is external. The Vault is our primary communication tool. Our med chemists check daily for new biochemical and/or cellular dose response data to drive SAR and design of new analogs. When we hold virtual meetings, we use the Vault as our primary tool for sharing data. It is extrememely convenient to be able to pull up all of the data on a compound, along with physicochemical properties, and eastily search for data on related compounds, etc. The ability to eliminate outliers from dose response curves on the fly is also very handy, as it allows you to firm up SAR in real time. Cons: Uploading new compunds can be tricky if different SMILES formats are used. Pros: We were able to get up and running fairly quickly, importing old data and adding new from a similar product. CDD Vault did a great job of reading in some pretty wonky SMILES structures. It's hard to imagine a more cost-efficient way to handle chemical inventory, in-house and store bought, and biological data. You don't need a full time data dude with CDD Vault. Cons: As a medicinal chemist who grew up with MDL, there's not much here to complain about. There a few interface conventions that take a little time to get used to. Overall: CDD Vault provides a cost and time effective way for us to manage all of our compounds (internal synthesis, reagents and compound library) in one place. To date, we're starting to populate the database with our bio data and are just beginning to use the data mining tools. I have been extremely pleased with CDD. Makes it easy to manage and analyze data on our compounds. Pros: My company uses CDD for our chemical registration, as our database, for data analysis, and some data processing. CDD is extremely easy to use and has great functionality. Much easier to use than other comparable database programs I have used. Cons: Nothing comes to mind. I have been very pleased with overall performance. One possible con - for some compounds in the database, I have attempted to alter the orientation the molecule is displayed in, but it hasn't worked. Not that big of an issue, and I could probably find a worked around if this was important enough. I use the CDD Vault for our data management in our academic drug discovery lab. Pros: the Vault is so easy, flexible, and intuitive to use, and requires nearly zero maintenance. It's a very cost effective way to recapitulate industrial-style databases in a smaller environment. In addition, it allows us to easily and smoothly share our data (structures, biology etc) with our many collaborators around the world. In addition, their customer/technical support is astonishingly fast and helpful. Cons: I'd love for there to be a mobile app! Frequently I'm in a meeting or on the road, and want to quickly look something up. Pros: Easily store and retrieve data and use it within the app for modeling and visualization. CDD provides analytical tools such as calculated properties and some in silico calculations. Entering data is facilitated by flexibility in setting up data fields, and customer support is extremely helpful getting everything running smoothly. Cons: Very little not to like, so there isn't much to say here. Overall: CDD Vault allows me ready access to the latest data to keep me up to date with my clients' projects. The staff has been extremely helpful. We've used CDD for close to a decade, and plan to keep using it for at least the next decade! Cons: CDD does not have the flexibility and features of some other platforms that cost considerably more, but given the ease of use, the price, and the customer support, this is a fantastic tool. Also, as noted above, CDD continues to add new functions. Overall: We use CDD for most of our compound and data management. Overall: Excellent product for collecting, organizing and analyzing all program data - compound and related biological data . This results in better and faster decision making. 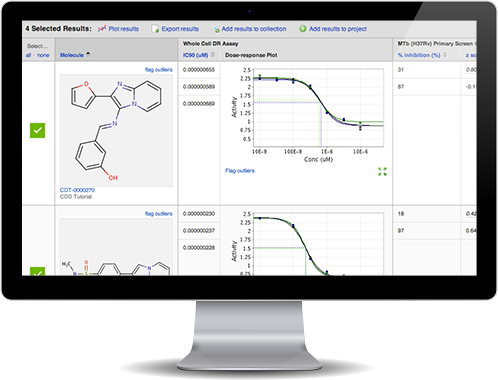 Pros: Powerful and reliable way to register and track compounds for drug discovery. Cons: As with any software, there is a learning curve. Overall: We keep our corporate database of molecules and related data on CDD vault. We are a mostly virtual biotech company and have found CDD to be a good and economical solution to registering molecules, keeping track of batches, and tracking data. No need for a server and someone to manage it. Also, CDD has great training and support, often having solutions already figured out that can be used without much set-up. Excellent support team. Great product. Easy to use. Pros: It works! Simple interface for data analysis and data upload. Great data visualization software. Excellent team to deal with and very responsive. Cons: US based support means that I can't always get immediate response to technical questions (I am in a different timezone). Overall: easy to give feedback and navigate through questionnaire. Pros: CDD Vault is a powerful chemical database registry that is simple to use. They are constantly adding new features including a Bioassay database and Electronic Lab Notebook. Cons: Like all chemical registries, data needs to be organized or formatted a certain way for optimal use. Overall: Overall, this software has proven to be a valuable tool for compiling compound rich data in a very accessible way. Pros: CDD Vault allows users to search across multiple projects, and retrieve positive (biological) and negative (toxicity) data easily. The ability to plot results in CDD Vision, and to integrate results with Optibrium's StarDrop application greatly aids in SAR/SLR determinations. Cons: Fonts used for column displays are somewhat small (for me, anyway). Several default settings could be modified to improve overall "look" of exported result tables. Cons: The software is not entirely intuitive if you are not used to working with databases; however, the help features are extremely useful and the CDD staff are always willing to help!